After my Record Store Day debacle-turned-triumph last year, I was not going to RSD 2011 go down the same road. This year, I had a plan. Amanda and I got out pretty early and really enjoyed the windy, overcast day together. Starting out at an undisclosed location, (sorry, I was third in line due to it's under the radarness and I'd like to keep it that way), I was able to quickly pick up the vast majority of what I was looking for. The store I visited didn't have large quantities of each selection, but it did have a really diverse spectrum of almost every RSD title. Everyone who worked there was super nice too and seemed stoked that people were waiting in line for them to open up. At my first stop, I was able to pick up the Hormoaning 12" EP by Nirvana, "Gotta Get The Feeling" 10" by Bruce Springsteen, the "Let's Shake Hands" and "Lafayette Blues" 7" singles by The White Stripes, the "Love Hurts" split 7" single with Jenny and Johnny on one side and Gram Parsons and Emmylou Harris on the other, the R.E.M. package containing the first three 7" singles from Collapse Into Now, the Class Mythology 2x7" EP by Ryan Adams and The Cardinals and "Dance Me To The End of Love" 7" single by The Civil Wars. Although they didn't have a few of the things I was looking for, it was a nice haul for the first stop. My second stop was also unsuccessful in regards to the missing pieces, but I was able to score the "Havana Affair" split 7" single with Red Hot Chili Peppers on one side and Ramones on the other. For my third stop, I hit up Third Man Records because I knew they would be selling two of the missing records I wanted to pick up. I got there about 10am and picked the line for the Rolling Record Store over the line for the store front because it was a tad shorter. While standing in line waiting for the noon opening, we got to see both Jack Lawrence and Jack White pull up in their cars and go into the store. About 11:30 the yellow bay door opened up and RSD at TMR got kicked off. Nashville mayor Karl Dean was on hand to present Jack with the first Music City Ambassador Award, which Jack graciously and quickly accepted. Ben Blackwell said a few words and then the music started cranking, records started selling and food trucks started shelling out some warm food. The stage for the Jerry Lee Lewis concert was set up and they were transferring equipment from the indoor stage to the outdoor stage all afternoon. While the wait in line was quite lengthy, I was finally able to purchase the spectacular "Vicious" 7" single by Karen Elson and the "Two Against One/Black" 7" single by ROME featuring Jack White and Norah Jones. As an added bonus, I ran into Relient K drummer, Motorhome singer/guitarist and all around cool guy Ethan Luck and got to talk to him for a few minutes. He's been in a lot of bands that I listened to as a teenager (Dingees, Supertones, Value Pac, Project 86, My Red Hot Nightmare) and it was super cool to just talk to him about records and Public Enemy since he had just seen Chuck D at Grimey's. It's always nice when a musical hero turns out to be cool in person too. As an added RANDOM bonus, actor Edward James Olmos of Miami Vice and Stand and Deliver fame was also milling about Third Man for some strange reason. 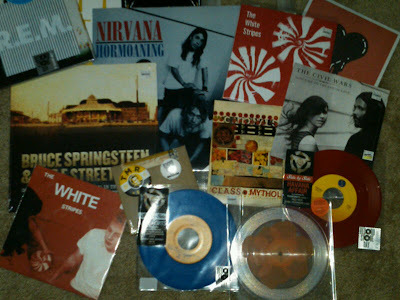 All in all, it was a fantastic Record Store Day and I was able to get more releases than I missed out on. Regardless of the convenience of digital music or the cheaper prices of big box retailers, supporting record stores who are selling tangible, vinyl releases is a great thing. A big thanks to everyone involved in Record Store Day, including the bands who continue to throw a bone to the fanatic, vinyl fan base. Is it too early to start counting down to next year? Most Interesting Award: "Vicious" 7" by Karen Elson - A gorgeous display of peach rose petals pressed into clear vinyl. Sure it was the fake kind of flower petals that they use for gravesite arrangements, but it's still stunning nonetheless. The A side, "Vicious," is a Lou Reed cover and the B side, "In Trouble With The Lord," was recorded during the sessions for her debut album and hasn't been released before now. Surprise Packaging Award: Hormoaning 12" EP by Nirvana - Since no special vinyl color was mentioned anywhere, I just assumed this release would be on black vinyl. I was pleasantly surprised when I opened it up to see an incredibly cool burnt orange color with black marbled streaks in it. It looks very 70's-ish and I'm really digging it. Cool Concept Award: The "Side By Side" split singles - With an original recording on one side and an awesome cover on the other, these releases on colored vinyl have a really cool draw to them. I bought "Love Hurts" on deep blue vinyl and "Havana Affair" on red vinyl. Although the stores I visited didn't have them, there are a couple more in the series; "Don't Want To Know If You Are Lonely" by Husker Du with a cover by Green Day on orange vinyl and "Just Got Paid" by ZZ Top with a cover by Mastodon on yellow vinyl. They also released 100 clear vinyl copies of each pressing, although I haven't seen any pop up yet. I really hope they do these again next year!